The Designated Safeguarding Lead is Mrs Snowdon-Poole. The Deputy Designated Safeguarding Lead is Mrs Young. They are assisted by Miss Janusewski and Mr Coupland. The governor with responsible for overseeing the work of the Safeguarding team is Mr. Drake. If you do have any worries or concerns regarding the welfare of a pupil, please do contact us. We are always available on the playground in the morning or you can make an appointment to see us by calling: 01332 766815. This page aims to share information about St George's approach to safeguarding, along with information on how to promote safety for all of our learners in their activities linked to learning inside and outside of school. These links contain information for parents on keeping children safe online. They include useful tips and the latest updates for ways to promote safe browsing and use of the internet. Information to promote responsible use of soical media can be found in the information sheets attached. Also by clicking on the link below. 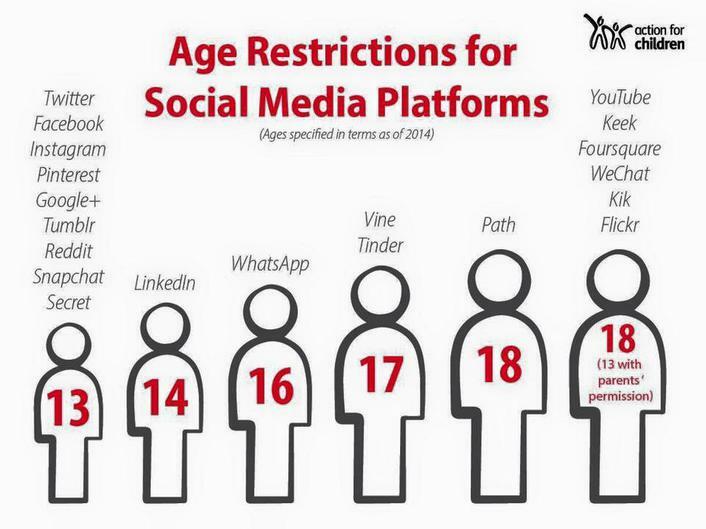 The infographic shows the ages children must be to join a range of social media platforms, some might surprise you! NSPCC information for keeping children safe online. Click here.